Interesting . Haven’t we got a lot of Southernish tanks appearing at moment ? I’m thinking Hattons little 0-6-0 , is it a P, aren’t Dapol doing a Terrier? I admit I don’t know what an E1 is , but they all look pretty similar to me . Is there really a demand for all these 0-6-0 tanks ? And for good measure you can always rebuild one to an E1R. Well the E1 was sometimes referred to as a 'stretched Terrier' by Brighton crews. Awesome news. With the recent USA tank to such a high standard it’s hard not to be excited. I’ll definitely be getting both early crest versions. With the small SR tanks being limited to such small numbers within classes it’s easy to justify multiple of different classes on a layout. Oh my poor, poor wallet. I could not find anything on the MR website though. Is this the announcement they are supposed to be making in a few days time? Is this not embargoed? It's not "officially" announced yet. It was leaked early both online and with people getting their magazines early. It's alright to discuss as Chris has commented in the other thread. Yes, and not any more. There is also a BR 16XX 0-6-0PT. I only came across it because a certain man named James (Edwardian) hinted at it then revealed it having got a copy of the magazine. Was wondering why there hadn't been the usual full release works from Andy. I might be tempted by version MR-405, number 2606 (date and month of my birthday) as it suits some of my late 1940s era rolling stock. It will be interesting to see what detailed variants come out. Early in their lives, they seem to have had condensers. I wonder if the IOW did any special modifications like they did for the O2? The BR weathered version looks interesting and I am keen to have a first taste of how Rapido weathers locos. I expect we will have more details of each variant first before deciding which to express an interest in. I understand that four were sold off and used elsewhere. The preserved 110 come instantly to mind, sold off to Cannock Colliery and now on the IoW. So perhaps we will get an NCB liveried one later. I am modelling the Taw Valley, so a rebuilt E1/R at later date would be ideal for me. Rather than trying to produce an E1R from the toolling, I wonder if a D tank would not be an easier proposition? There were "only" 125 of them and they had long lives on local passenger and push-pull trains. It will be interesting to see how well the colour of Improved Engine Green is captured, and whether the subtleties of the cab roof and the tank tops, which should be slightly recessed, are reproduced. But then again the UK's railway system (not just the Southern) was littered with small tank engines of numerous classes, and some of them quite attractive, and so far the models produced appear to have found customers. I imagine this 'picking up the crumbs' operation will continue until a well runs dry. The question for me is which ti will be: the money or the available subject list? That looks pretty straightforward, as the new cab and bunker is larger, so the new cab and bunker could just 'wrap' the cut down original for secure location. As an alternative to plasticard fabrication it might make a good 3D print project? In 'thinking ahead' mode you might request that Rapido mark the radial axle position on some convenient concealed part of the frame representation as a guide to those wanting to make the conversion. E1 was not a small class, with 80 examples! The Brighton had been full of ones and twos in J C Craven’s time, as he seemed to like tinkering, but Stroudley was strong on standardisation. 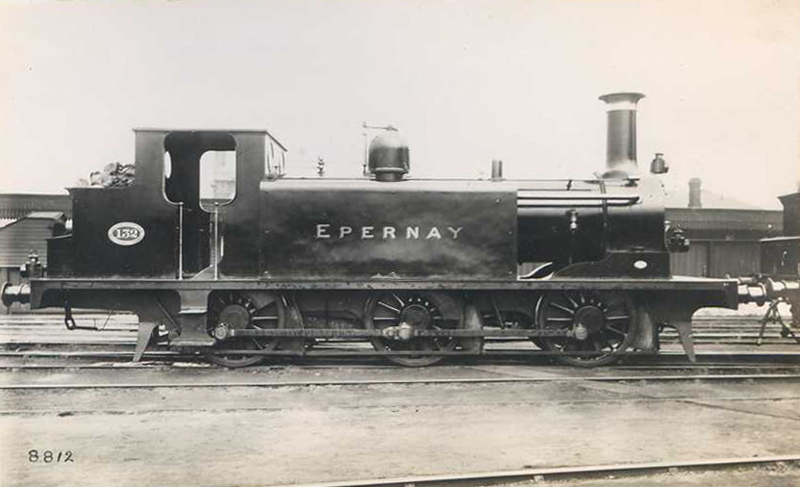 The E1 was a success - but train weights began to increase and so Stroudley’s successor, Robert Billinton, created his various classes of radial tanks which were more puissant and led to E1s being laid off earlier than their sound design might suggest. When you consider the LNWR had 943 DX Goods and built another 86 for the L&YR, then it's a miniscule class. Both in size and number. I wasn’t aware that comparison with other railways was part of appreciating a newly-announced model. I agree. For these Southern companies, 80 was a large class overall, and, as you say, particularly for the time. The Terriers were 50-strong in comparison. So, yes, in the context, the answer to Big James is, no, not a small class! Huge class when compared to the other Southern 0-6-0T's currently available... especially when compared with the P's. I would love to see a DX Goods, but that hasn't been announced and this has, and I'm sorry to break it to your little LNWR heart, a prettier appearance and prettier liveries! I seem to recall there are some dimensional differences between the E1 and D1, so the Finecast kit that uses the same body for both is only accurate for one of them.